Cult leaders like Kris Vallotton are master theological pretzel makers–eisegetes who twist Scripture to accommodate their twisted, sordid agendas. Like other false teachers at Bethel Redding, Vallotton preys upon the non-Bereans who follow his “teaching”–people who will not turn to the scriptures to see if what what Vallotton is feeding them is poisonous, let alone edible. The above meme (courtesy of Chris Rosebrough) includes a quote from Vallotton’s book, Heavy Rain (p. 275). What we have here is an example of a blasphemous ideology, which comes out of the apostate Word of Faith movement–the idea that human beings can create something out of nothing, by the power of their faith and words. Vallotton goes so far as to tell his readers they can be “co-creators” with the Creator of the Universe–God. Vallotton takes the Roman Catholic blasphemous and damnable heresy of Mary as co-redemtrix to an even more blasphemous level when he writes: “What she [Mary] imagined became flesh and dwelt among us.” While the Roman Catholics hold that Mary is an integral participant in the redemption of souls, Vallotton takes things a step further by daring to assert that Mary’s imagination and dreams played a part in the incarnation of the God-Man Jesus Christ. Of course, there is absolute no support for this heretical notion in Scripture. But then, Vallotton, like other cult leaders, is well-known for minimizing and marginalizing the authority of Scripture. Yes, Mary played a vitally important role in the incarnation of the Word Become Flesh. She was chosen and blessed of God to be the earthly mother of the King of kings and the Lord of lords. 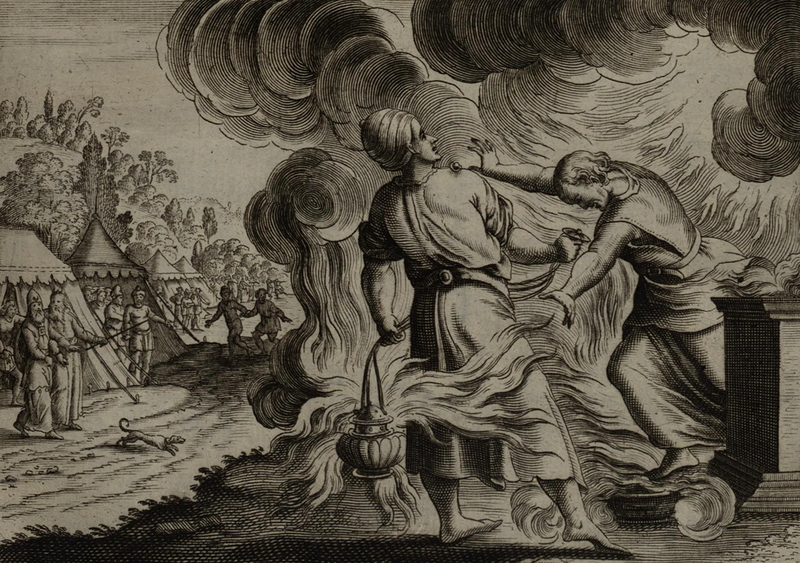 However, she was not a participant in the sense that the incarnation was in any way contingent upon her cooperation, faith, imagination, or dreams. She was a recipient of God’s grace and mercy. She was chosen by God for the her role she played in the greatest of all miracles. Mary is not a co-redemtrix. And she was not a co-creator in the incarnation of God in the Flesh. 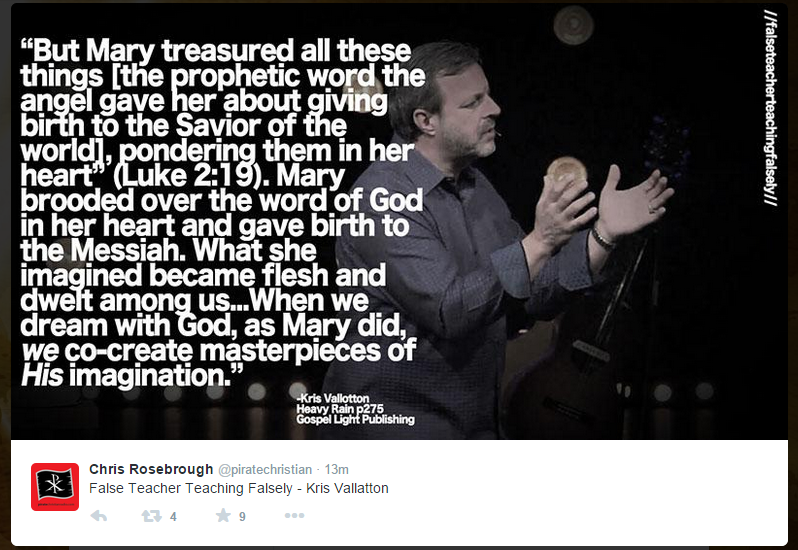 Kris Vallotton is a dangerous, false teacher leading thousands astray and into sin, by encouraging people to believe they are God-like with the power to create–a power given to no mere man–a power wielded by God alone. Bart McCurdy, his teenage son Billy, and I went to Bethel Redding to attend the group’s evening gathering. We went simply observe–to see what takes place during a Bethel meeting, with their own eyes. As we approached the front door of the building, we were met by Sean, a member of Bethel’s security team. We introduced ourselves. As we walked in the door, Sean stopped us and said that a pastor would need to talk to us before we went any farther. Moments later, the head of security and two staff pastors arrived. They explained to us that because of the way they had “dishonored” the leadership staff of Bethel Redding, via Facebook, Twitter, and Youtube we were banned from being at Bethel. Here’s the audio of our encounter with staff members of Bethel Redding.